San Francisco 49ers quarterback Colin Kaepernick has been fined $10,000 for wearing Apple's Beats by Dre headphones following a ban on the brand after the NFL signed an exclusive deal with Bose. Kaepernick opted to wear bright pink Beats by Dre headphones following last Sunday's game against the Chiefs, in order to "pay homage to Breast Cancer Awareness." Kaepernick declined to say whether Beats paid his fine, saying "I'm going to let that be unanswered." 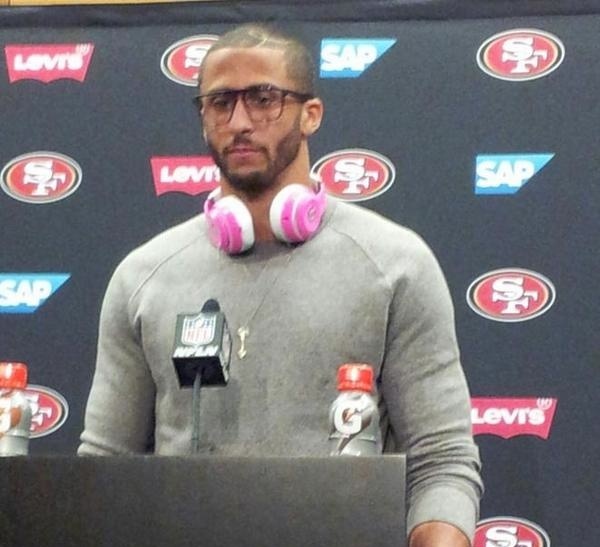 Kaepernick, along with a number of other high-profile NFL players, has an endorsement deal with Beats. Last year, he starred in a popular Beats ad that depicted him tuning out the negative comments and boos of opposing fans by wearing Beats noise-canceling headphones. Bose and the NFL signed a sponsorship agreement before the season began, but last week the NFL decided to ban players from wearing Beats headphones in front of television cameras to support its sponsor. Players are not allowed to wear them when conducting interviews during training camp, during practice sessions, or on game day, from before the event until 90 minutes after play has ended. This is the second time Beats headphones have been banned from major sporting events. Earlier this year, World Cup headphone sponsor Sony banned soccer players from wearing Beats headphones within stadiums, and during the London Olympics, the International Olympic Committee ended up banning Beats headphones after a guerrilla marketing campaign because the company was not an official sponsor. I hope this whole thing blows up in the NFL's face. I would never buy beats, but to tell people what headphones they can wear is ridiculous. Beats might get more play out of this thing that Bose does.... love it. Yay, it cost him 1 minute of work! This makes the NFL look like a bunch of A holes due to him wearing it for breast cancer. This ban has been a genius move for marketing... Beats. LOL, Streisand effect. Now people will pay extra attention to Beats phones, trying to catch the "transgressors" on the field. this is idiotic people get fined less for illegal hits... shows how much the league actually cares about their players. Now Beats will become a symbol of rebellion. Best advertisement $10K can buy. Well done.